With temperatures easing their way up higher and higher, it is now time to step out of the kitchen and venture outside to cook up your favorite dishes on the Gourmet Guru Grill. One of the go-to favorites for spring and summer meals is the addition of freshly picked or purchased vegetables as a side dish. Here are a few tips to help you master the art of grilling fresh and colorful veggies. After your vegetables have been thoroughly washed and dried, take a few minutes to toss them in a light coating of the cooking oil of your choice. Not only does adding a little bit of oil keep your vegetables from drying out, it also helps your seasoning stick. There is no need to add a lot. Doing so can ruin the flavor. Since some vegetables take longer than others, you may need pre-cook them before placing them on the grill. Vegetables such as carrots, asparagus, and potatoes can take a long time on the grill. If you need to speed up the process, try pre-cooking them on the stove in a skillet or in the microwave. This will not only speed up the process but will also ensure that they get cooked all the way through while getting that flame-kissed grilled flavor you love. Depending on the vegetable you are grilling up, you may want to use items such as a grill basket to keep all of your vegetables in one place. Gourmet Guru Grill has their very own stainless steel grill basket which is perfect for grilling vegetables and smaller meats like shrimp and wings. You can also use skewers to keep round vegetables like potatoes and small tomatoes from rolling around. Skewers are also great for the popular shish kabobs. Another trick to get a more baked flavor and texture is to place your vegetables in a foil packet or place them directly on the Gourmet Guru Grill Ceramic Plate Setter. When it comes to grilling your vegetables, you don’t have to throw them on the grill as is. In fact, many suggest that you take the time to cut and slice up your vegetables in a way that is best for your grill and the vegetable. For example, onions need to be peeled and cut into ½ inch thick rings, bell peppers are cut lengthwise, and squash and zucchini are cut into slices or strips. Cutting and dicing your vegetables correctly before grilling will have a huge impact on the time it takes to grill, the consistency, and the overall flavor. 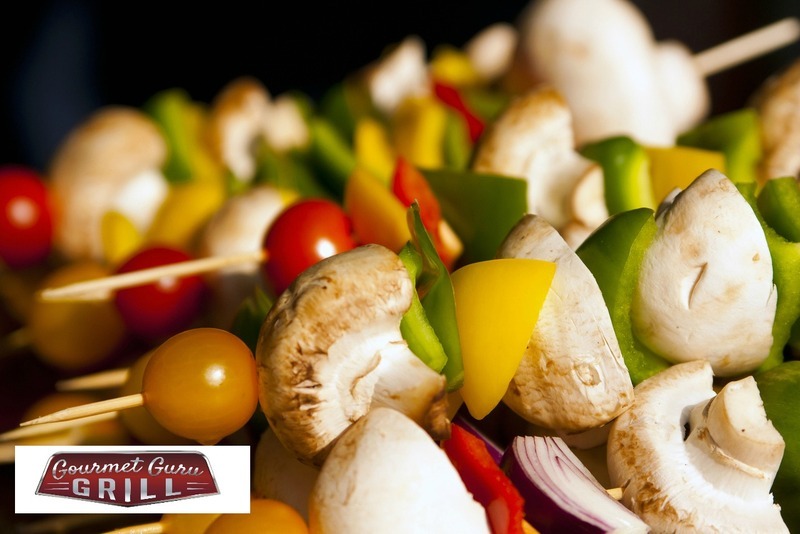 Adding a few vegetables to any meal is great, but when they are fresh off of the Gourmet Guru Grill, they are perfect! Try adding a few of your favorite grilled vegetables to Brother Jim’s Famous Gourmet Smoked Chicken. Rinse chicken and pat rub dry. Rub down with oil. Place butter into the cavity. Sprinkle seasoning over the bird. Place chicken on preheated grill at 300°-350° F until internal temperature of the chicken reaches 165° F. Let stand for 5 minutes then serve.